Tonight I made a couple cinnamon bun candles after purchasing the cinnamon roll fragrance oil to match it. 30 ml (2 tbsp) of the fragrance in a pound (453 g) was quite sufficient. 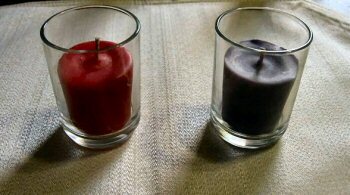 I’ve been having fun getting this Etsy store started, and I thought I’d share some candles with you since you’ve been here through my experimenting. 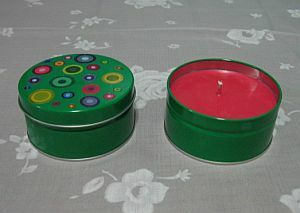 I’m donating two 6 oz (170 g) travel tin soy candles that I made for this auction to help Japan. They have been overwhelmed with problems since the tsunami and every little bit helps. This lantern is another one of my thrift store finds that I dressed up today and filled with Millennium container soy wax. Today I successfully hardened up my soy wax for pillars and votives by blending it with palm wax. 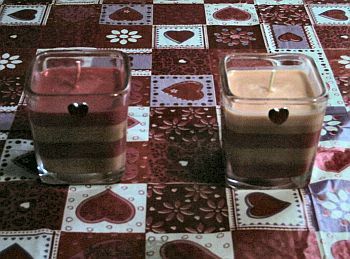 Massage candles are perfect for Valentine’s Day because they double as both candles and massage oil. Mrs. Tattoo Geek has some unique scented soy candles! They are packaged in tins and the artwork on the lids resembles tattoos. My family thought that these striped chocolate cherry candles smelled divine when they came home. They were disappointed when they realized I wasn’t actually baking any sweets though! 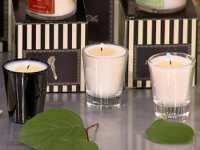 Sandra Bullock launched her Bessence soy candle line in April. 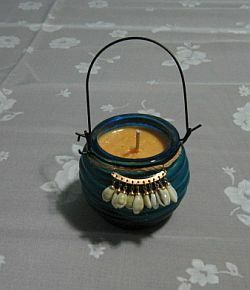 The eco-friendly candles are hand poured and lead free with paper wicks. I bought some lavender essential oil and decided to make some tarts for the burner that my daughter bought me. 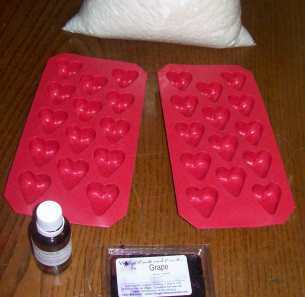 I found these cute heart shaped flexible molds at the dollar store.